149 Experience 1 credits awarded to those who replied to this thread. 1 time for each ID. Hope you all doing good . Month ago Redmi By Xiaomi Announced RN7,main key highlight was it's 48 MP cam ,Redmi Not only launched RN7 but also announced Pro version of RN7, which will also come with 48 MP but with Ultra Clear Sony IMX 586 Sensor .So today let's talk about this sensor . The new Sony sensor features 48 effective megapixels,*2 a pixel count which rivals that of high-performance SLR cameras, making it possible to capture beautiful, high-resolution images even with a smartphone.The new sensor uses the Quad Bayer color filter array, where adjacent 2x2 pixels come in the same color, making high-sensitivity shooting possible. 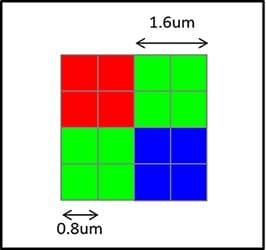 During low light shooting, the signals from the four adjacent pixels are added, raising the sensitivity to a level equivalent to that of 1.6 μm pixels (12 megapixels), resulting in bright, low noise images. mvnaidu88 + 10 + 3 Thanks! Great, waiting for this to launch!